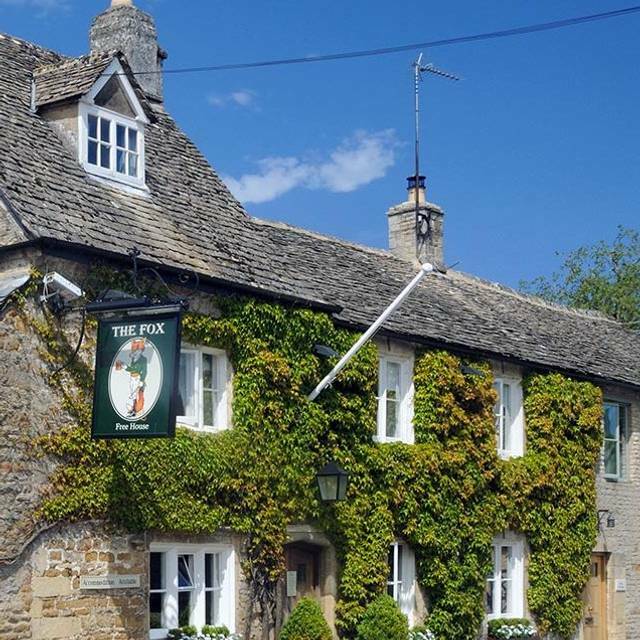 This Virginia creeper clad, Cotswold stone inn with flagstone floors, exposed beams, open fireplaces and a collection of antiques is the quintessential British Pub. The Fox Inn is a perfect setting for either a cosy, romantic meal or a larger family get together, or maybe you want to escape from it all and enjoy a relaxing break away in this wonderful part of the Cotswolds. Nearly walked out initially: stood at the quiet bar for quite a while until our presence was finally acknowledged, whilst the sole member of staff chatted to a presumed regular drinker. Pointed us to a table, not given menus. Two other tables were already occupied by diners waiting to order. Eventually brought menus; a second member of staff appeared and took our order ahead of the other tables, apologising that he’d been taking nap. All other tables occupied later. Food very good, quantities modest. Wine rather overpriced (Picpoul de Pinet £28). Have visited this pub intermittently over a 20-year period, during which it has changed hands several times. Originally excellent, but took a dive a few years back; food quality now restored, but we did not feel very welcome: all a bit cliquey. Wouldn’t rush to return. We had a lovely lunch although quite expensive for what we had....especially as it was just a lunch. It was very noisy with dogs barking. Don’t agree with dogs being aloud while eating! The service was very good and we were made very welcome. Will certainly go again, having said that as I said I do feel that something should be done about dogs while eating. I love dogs but do feel they shouldn’t be aloud while eating! An all round lovely lunch out. Sat right next to the fire, amazing double cheese soufflé and lovely French owners, attentive and not overbearing. Go to The Fox! We previously enjoyed two delicious meals at the Fox since our first visit in January 19. Unfortunately the last meal was such a disappointment. The stone bass was over cooked , the stew accompanying was taste less, garlic bread was burnt, the fish and chip meal that my husband ordered was just adequate, but nothing special, the chips were completely dried out, probably kept warm, it was like the original chef was on holiday and agency staff had taken over. Touch and go if we will return, such a shame. As always the food and service was excellent but unfortunately there was a very strong smell of some sort of fuel as we came in and which lasted the whole evening which spoilt our experience somewhat. We went to the Fox following a recommendation by a friend... it was perfect! The food was outstanding and the welcome we received was warm and sincere. Would thoroughly recommend a visit! A very enjoyable evening with friends. Very good food and good choice of wine. Only adverse comment was that the service, though friendly and generally good, lapsed at times, notably after the food when we had to chase up the coffee and then the bill. This is a common fault with restaurants and a shame as it’s good to leave on a high note. Delicious food and outstanding service. We went out for dinner as a birthday treat for my Sister and had a really wonderful time. The decor was candlelit, tweedy and cosy, our waiters were attentive and cheerful and the food was well balanced and tasty. When, at the end of the meal the waiter realised we were celebrating he quickly rustled up an ice cream and candle plus some colleagues to sing a hearty ‘Happy Birthday’. Great relaxed place for a celebration. Very good food but the overall experience wasn't because of the service. We spend there around 3hours because of the delays. Waiters were running from one place to another without taking us the first order. We also suffered delays between dishes. We visit quite a few times in year and always have great food in a pleasant atmosphere. Service was a bit slow this lunch time, but they did apologise when we came to bill. We had a thoroughly enjoyable sunday lunch at this pub - staff could not have been more helpful. We visited The Fox Inn for a birthday celebration and were made to feel very welcome including our very well behaved border collie. The food was lovely and the service was excellent. All in all a great evening and then went back the next day for Sunday lunch which again was very good. Thoroughly recommended. Delicious food. Good atmosphere. Charming & efficient staff. We had a great time. Food and service were everything we could have wanted. Good atmosphere without it being packed. Chicken Supreme and Ox Cheek both highly recommended. Great food, great wine and great staff. Favourite place to visit in the area. The service is really what makes this restaurant. Sam and his colleagues are outstanding and really do go out of their way to make you feel comfortable. An excellent traditional and cost setting ... log fire roaring. Great service. The cheese souffle is the chef's special amongst the starters. Plenty of traditional country fare, as well as pub classics. The wine list may not be very long ... but some excellent choices. The Fox is a lovely pub restaurant with a warm, welcoming ambience. The food is outstanding and all 4 of us thoroughly enjoyed our meals from start to finish. The service was initially very good and the staff were attentive: as the evening wore on, they became less so and we had to get up twice from our table, first to ask for the dessert menu and again for the bill. The music was a tad too loud and at times we were struggling to hear each other. So, great food - just work a little harder on the other important details! Although our meals were delicious when they arrived the service was not good, given it was a busy lunchtime but we had prebooked. We had to wait over 30 minutes for our orders to be taken and then another 20 minutes or so for our starters. The portion sizes were adequate but not generous considering the cost, we did enjoy our meals but could have eaten more! Food, staff and service top notch, would drive the 2 hours again to visit this place. Meeting up with friends for lunch. Good food, friendly and efficient service and warm ambience. Will return. Brilliant evening at the Fox. Service really friendly and efficient, couldn't have been better .Food wonderful and well performed , with a good wine list to match at sensible prices , mixed with a very good atmosphere , we will return soon ! So glad we booked this for a great night with fabulous friends which we hadn’t seen in a while . The food was incredible , most notibly the cheese soufflé which we couldn’t stop raving about . It was so good we considered ordering it again for desert !!! The service was fantastic , the food divine , the atmosphere cosy and quirky . I would highly recommend this place and will be returning soon . They are kind to let us in very muddy and often late for the table. We were bad customers but they were great hosts !! Great to report ours was a return visit, this time celebrating a birthday. The staff were fantastic throughout, all seemed to enjoy making time for our 10yr old, helping him to enjoy the experience. Great food for our late Saturday morning brunch, we were made to feel most welcomed. Very disappointed. Been here before 10 years ago. Soufflé very poor. Very poor service: staff brilliant in circumstance. Puddings mediocre. Very disappointed as had driven over 1 hour to get there. Excellent service and delicious food albeit a bit pricey but had a lovely time, we did not, however, enjoy having dogs off the lead in the restaurant. The Fox never fails to impress. The service is friendly and efficient - despite being busy the staff always find time to smile and have a few words, and can advise on the menu and the wine. It is a great pub for many occasions, but Sunday lunch it really comes into its own as the roast dinners are exceptional. The service needs improving , nice staff just forgetful . Everyone very busy but not a lot of corodination . Outstanding food, ambience, staff and service. Paulina was charming and delightful, as were all staff. The nicest pub in the Cotswolds and beyond, that we have visited!